After giving my mom a copy of Garden Gnomes: A History (see my book review), she went through her old photo album and found these two shots of me. I look about 2 or 3, so I'm guessing the photos are from around 1980. This is my grandfather's backyard in Rotterdam, NY. 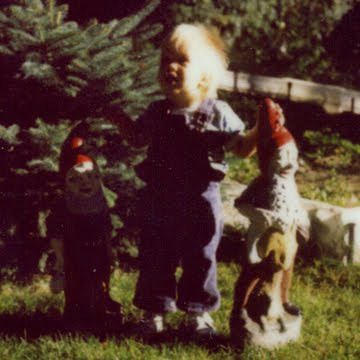 These two gnomes were given to him by his friend, Mr. Heiner. 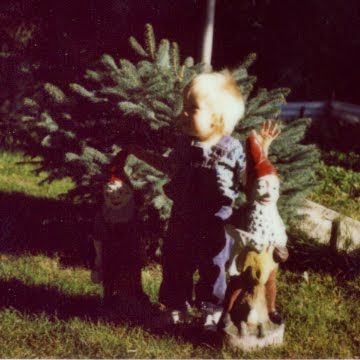 His parents came from Germany, and obviously they brought their tradition of garden gnomes with them. The concrete gnomes were home-made using Mr. Heiner's own mold. I think my grandpa painted them himself. The subject and composition are pretty cool, but the image quality of these photos ain't so good. Unfortunately, my face and the smaller gnome are concealed in shadow. For a while back in the 70s-80s Kodak sold an instant camera. An avid photographer, my grandfather had one of these Polaroid-like cameras. Polaroid sued, and Kodak was to drop the product. I remember disassembling the then useless camera years later to see what was inside (mirrors, lenses and other interesting gizmos).